Assessment of progress during HLPF 2018 showed that the world is not on track to achieve access to energy and clean cooking fuels for all (SDG 7). Annual global fossil fuel subsidies are 7.5 larger than the investment required to achieve energy access for all. Fossil fuel subsidy reform (SDG target 12.c) could accelerate progress towards achieving SDG 7 by removing subsidies that do not support energy access, targeting subsidies towards energy access for the poorest, and swapping fossil fuel subsidies to investments in renewable energy. Sustainable Development Goal (SDG) 7 calls upon the global community to ensure access to affordable, reliable, sustainable and modern energy for all by 2030. The High-level Political Forum on Sustainable Development (HLPF) in New York noted progress, but also established that the world is still not on track to reach the targets on energy access, energy efficiency and renewable energies. If we follow the current trajectory, 674 million people will be without electricity, and 2.3 billion people will still be cooking with fuels that are harmful for health in 2030, according to the UN’s review on progress towards SDG 7. Many of the people without access to modern energy are among the poorest of society. The urban-rural divide also remains important, with almost 87% of the world’s population without electricity living in rural areas. Affordability of energy matters for poor households. Often people assume that fossil fuel subsidies help the poor by making energy more affordable. In fact, most fossil fuel subsidies are not working well for energy access and poverty goals. 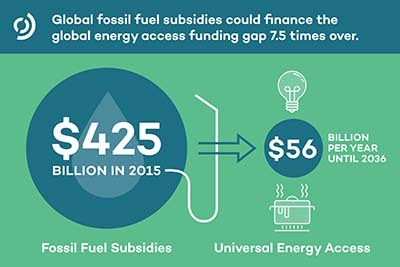 A new report by the Global Subsidies Initiative (GSI) of the International Institute for Sustainable Development (IISD) and discussions at a side event during HLPF found that untargeted fossil fuel subsidies are at best an inefficient and unjust tool for improving energy access. At their worst, they can have a negative impact on energy access. Fuel subsidies often exclude the poorest: without access to technology, such as an electricity connection, a gas cooker or a car, fossil fuel subsidies cannot be used at all. Fuel subsidies are also highly unfair: richer households buy larger volumes of energy, so they capture most of the benefits. A review by the International Monetary Fund (IMF) found that the poorest 40% received only 7.4% of gasoline subsidy benefits, while the richest 40% received 83.2%. For liquefied petroleum gas (LPG), the study found that 12.7% of the benefits were allocated to the poorest 40% and 73.9% to the richest 40%. This makes fuel subsidies highly inefficient as they achieve small energy access benefits at exorbitant costs. Fuel subsidies can even damage supply. If the financial burden for subsidies is pushed onto state energy companies, they may cope by restricting investments for energy access. Fuel shortages can arise through smuggling and diversion of subsidized fuels, or when governments cut back supply because they are struggling to manage subsidy costs. Subsidies are also not a magic bullet to support energy transition. According to recent research, even with access to subsidized fuels, households often do not transition completely to a new, or more modern, fuel. Households may use a clean and convenient energy source, but only for quick tasks like making tea or preparing breakfast, while they continue to use traditional sources of energy that are harmful to health or time-consuming to acquire. Factors such as availability and reliability of modern fuels as well as social and cultural factors – including taste – influence these decisions. Untargeted fossil fuel subsidies are therefore a very inefficient, and often ineffective, tool to improve the affordability of modern fuels for the poorest. Using untargeted fossil fuel subsidies to reach the energy access target can be compared to using a very unwieldy, heavy and expensive hammer for the renovation of a house, instead of opening the toolbox and using the tools that are adapted for the different tasks. Based on the International Energy Agency’s report titled, ‘2017 Energy Access Outlook,’ an additional investment of US$56 billion per year is required to achieve universal energy access. While this sounds like a lot of money, GSI estimates that US$425 billion was spent on subsidizing fossil fuels just in 2015 (combined estimate for production and consumption subsidies). This means that the global amount of fossil fuel subsidies is 7.5 times larger than the additional investment required to achieve universal access to electricity and clean cooking. While the exact potential for reallocation depends on which countries have subsidies and how savings can be used, given political and economic realities, there are several ways in which this could happen in practice. Recent statistics by the Organization for Economic Co-operation and Development show that fossil fuel subsidies cost 10 times the amount spent for energy development assistance. OECD countries supported fossil fuels with around US$82 billion annually in 2015 and 2016. 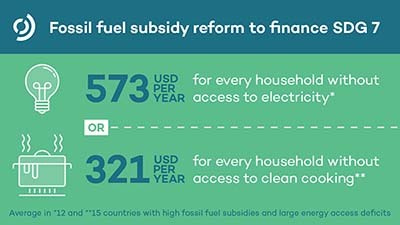 A large share of these subsidies supports the production of fossil fuels and is not directly linked to energy access. In comparison, OECD countries committed US$8.3 billion annually for development assistance to the energy sector in the same period (authors’ calculation based on data collected by the OECD Development Assistance Committee). Redirecting a share of the current financing spent on supporting fossil fuels towards energy access goals could accelerate the achievement of SDG 7. In countries with high fossil fuel subsidies and large energy access deficits, fossil fuel subsidies were found to be equivalent to US$573 per year per household without access to electricity (average of 12 countries) or US$321 per year per household without access to clean cooking (average of 15 countries). Fossil fuel subsidies also dwarf official development assistance to these countries. A comparison of fossil fuel subsidies with development finance disbursements in priority countries for energy access with high subsidies found that fossil fuel subsidies were 2 to 19 times higher than development assistance to access to electricity. For example, while Bangladesh received on average US$473 million in development assistance for electricity per year, the IEA estimated that fossil fuel subsidies cost more than US$1 billion in 2016. 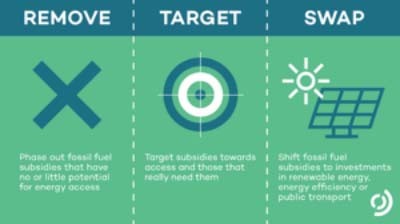 To achieve SDG 7, GSI recommends the following three approaches to accelerate energy access through fossil fuel subsidy reform: remove subsidies that do not support or might even hinder energy access, such as producer subsidies or gasoline and diesel subsidies; target fossil fuel subsidies that are currently deemed necessary to reaching SDG 7 towards access and those people that really need them; and swap existing fossil fuel subsidies by investing in renewable energy technologies and energy efficiency. Any attempt to reform subsidies needs to be implemented extremely carefully. Just because a subsidy is inefficient or not very effective does not mean that there will be no impact on poor households if it is changed. Social protection and targeted support is necessary to mitigate the impact of higher fuel prices on poor households. Many countries have shown how fossil fuel subsidy reform can be done, including India, Indonesia and Morocco. 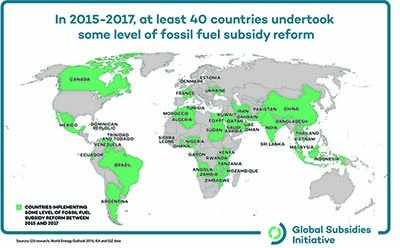 At least 40 countries undertook some level of fossil fuel subsidy reform between 2015 and 2017. Even more countries have endorsed the Communiqué on fossil fuel subsidy reform that calls for accelerated action to eliminate inefficient fossil-fuel subsidies in an ambitious and transparent manner.